Have you been looking for a positive and uplifting group on Facebook dedicated to Montessori and special needs? Do you have questions and concerns? Perhaps you're looking for support and encouragement? Or maybe you just need a new friend who's journey is similar to yours? Well, look no further! 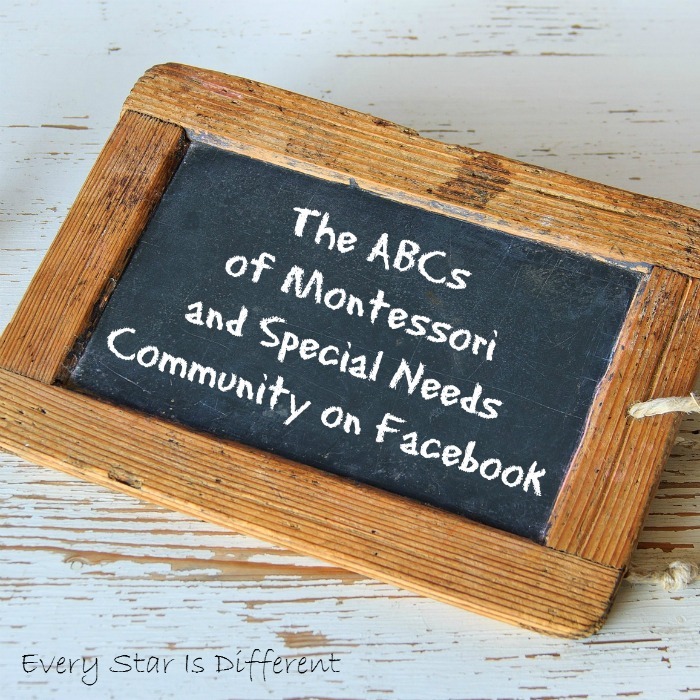 The ABCs of Montessori and Special Needs Community on Facebook is here! The group was inspired by my new book and the overwhelming response I have received in questions from readers. 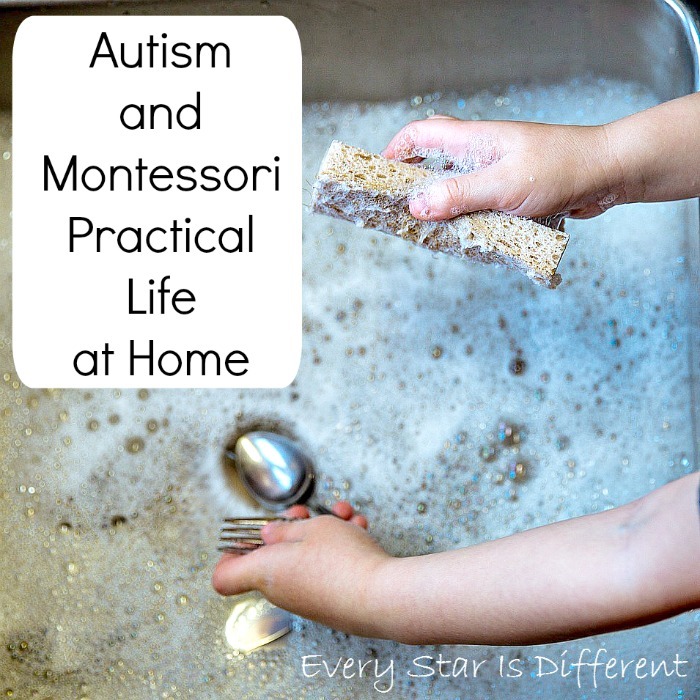 The group is for parents and teachers of children with special needs who are using the Montessori Method at home and in the classroom. 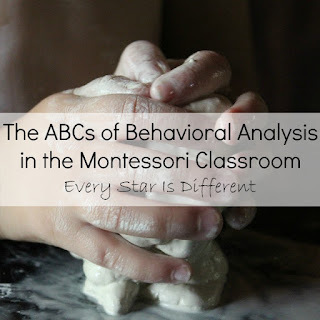 Discussions in the group have a Montessori focus, providing support and encouragement for all who are there. We have a very strict kindness policy: If you don't have anything nice to say, don't say anything at all. Every child with special needs is different, as is every parent and teacher. Those in the group are expected to be respectful. All rude or judgmental comments will be deleted. The person who wrote them will be banned. More than anything my husband and I want this group to be a safe place for parents and teachers to learn and grow. We look forward to hearing about successes and providing support during difficult times. 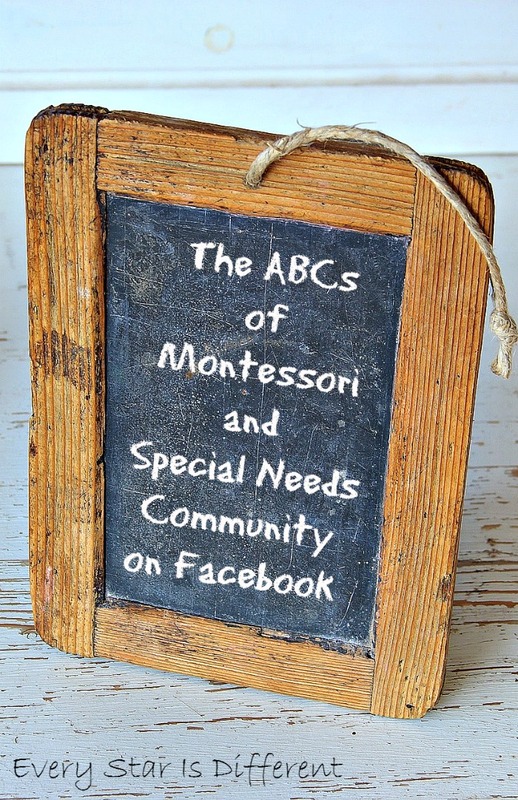 There will be an educational component to the group as we discuss topics from my book and focus on specific aspects of the Montessori curriculum in relation to special needs. We will also talk about Montessori materials and how to best use them with children who have special needs. This group is NOT a place to discuss controversial subjects related to special needs such as medications, diets, and/or vaccines. This group is NOT a place to give or receive health advice. This group is NOT a place to discuss politics and how they relate to special needs. This group is NOT a place for child, parent or teacher bashing. If you feel this group is for you, then we invite you to join now by clicking the link below. We can't wait to see you there and get to know you better! I surprised my boys with lunch at their favorite restaurant today, as we were running errands for the first time in almost two weeks. The last two months have been extremely rough on everyone. 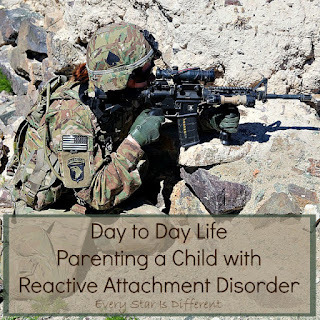 Between Princess' behaviors related to Reactive Attachment Disorder (RAD) and Sunshine's manic episode life has not been fun. I always feel guilty about how the girls' issues affect our lives, especially when it comes to the boys. It's not fair to anyone. There's a part of me that worries about how the things the boys experience today will affect their relationships in the future. 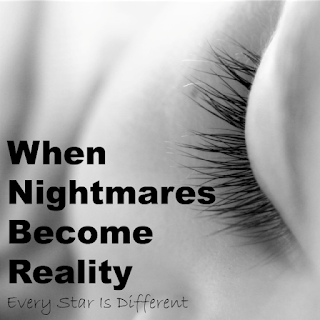 My biggest fear is that they will develop issues as they experience secondary trauma themselves. 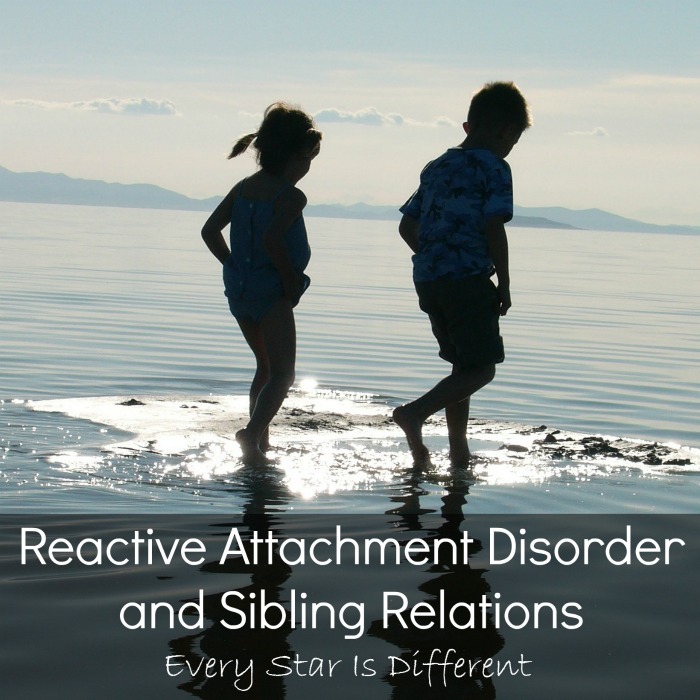 So today at lunch, knowing I would be writing this post tonight, I asked my boys how they felt about Reactive Attachment Disorder and sibling relations. I gave them permission to speak openly. Their responses were amazing and so unexpected. "I miss playing with Princess. Remember when we could play in each other's rooms? I wish we could do that again." Bulldozer chimed in that he missed playing with Sunshine too. He recalled times when he used to go into Sunshine's room and play LEGO duplos together. I was shocked. Here I was expecting all of these horribly negative comments. Why was I feeling so much guilt? I probed more asking questions about behaviors and safety. Every time their answers surprised me. Here I was planning to write a post about how hard RAD is on sibling relations. Instead, I've spent the remainder of the day trying to figure out what we've done right and how that happened. 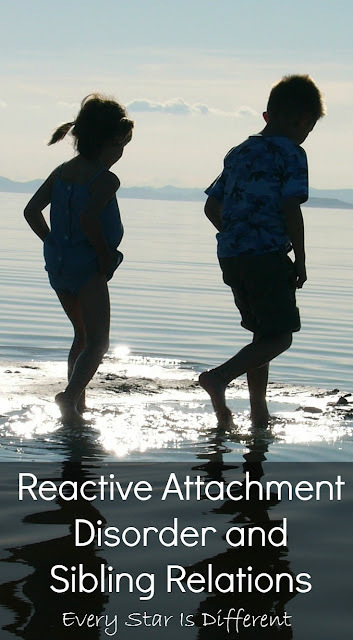 Reactive Attachment Disorder can wreak havoc on sibling relations. In fact, in some instances it results in victimization and abuse. A child with RAD will often target siblings. If the child doesn't abuse a sibling physically or sexually, there is almost always emotional or verbal abuse. A child with RAD most often does best in a home where there are no other children. I mention this because as I thought about our situation today, I truly believe that the boys' experience has been what it is because of some of these factors. Princess is only eleven months younger than Bulldozer and 28 months younger than Dinomite. She arrived in our home at six months of age. For all intents and purposes, the three have always been together. Sunshine is almost two and half years younger than Princess and arrived at about six months old as well. Princess tends to target females. This doesn't mean that she leaves the boys alone because she doesn't. But she feels safer with her brothers than she does Sunshine. Sunshine targets males, but her brothers are much bigger than she is. They are very quick to fight back if she tries anything. We do not permit bullying in our home. And relations between Princess and Sunshine... That's a topic for another day. We consider ourselves very lucky when it comes to the age and genders of our children and the order that they came to us. But that doesn't account for all that the boys said today. Much of what they said and how they feel has been a result of how we have handled situations regarding RAD in our home. So what have we done? We're not one of those families that encourages siblings to like each other. We make sure our boys know it's okay to not like their sisters. They're allowed to express that when they need to, especially when they're trying to work through feelings. As long as they are kind and respectful, they can feel however they'd like. The same rules apply to our girls. If they don't like their brothers, it's okay. Sometimes family love is best expressed from a distance. Our girls go to bed before the boys do. The boys know that when the girls go to bed, they can unwind, relax and spend time with Mommy and Daddy. We usually just hang out, cuddle, watch movies, and chat but it's our time. No matter how hard the day is or how long it takes the girls to go to sleep, the boys know they will get this time with us. If there's something special that the boys want to do that the girls can not participate in, we make it happen. It may take place late at night, but that's okay. The boys can sleep in when needed. No matter what we're doing, where we're going, or who's involved, there is always a safety plan. Everyone knows about this plan and what will happen if we need to use it. In those situations, the boys know that Mommy and Daddy will divide and conquer. The girls can not ruin their fun. If we know a situation will be too much for the girls, they don't go and the event turns into a date with Mommy or Daddy. All of our kiddos know that when they choose to make good choices, good things will happen. If they choose to make bad choices, there are bad consequences. That's how life works. We follow through with this every day. If someone makes a bad choice, time stops until they've apologized for the specific behavior, made amends, and followed through with the consequence. My husband and I are the parents each of our kiddos needs us to be. The way we respond to behaviors with each child varies. We express our love to each of our children in different ways. There is no one size fits all parenting strategy in our house. Most often our boys need the opposite parenting approach than our girls do, and that's okay. Through safety plans, routines, and rules in our home, we protect our boys from situations where they will be with their sisters alone. There is an alarm on Princess' door. The boys have a lock on their door. We're in the planning phases of turning our attic into a place for the boys, so their bedroom and bathroom are separate from the girls'. All sharp objects and prescriptions are locked up. Items that can be used as weapons, in that they will hurt if thrown or kicked have been removed from areas where the family gathers in the home. The boys play with their toys in their room with their door locked. When we are together and situations occur, we address them immediately. One parent handles the child causing the problem, while the other cares for the others, making sure they are safe, healthy, and happy. There are times when the boys are not aware that the girls are targeting them. They're not at an age where they understand manipulation, passive aggression, provoking, or any form or mind games. If we notice one of the girls is doing this, we call them out in front of the boys. This way everyone knows what's going on and that we're doing something about it. It's so easy to get wrapped up into negative behaviors and bad choices when dealing with a child who has Reactive Attachment Disorder. 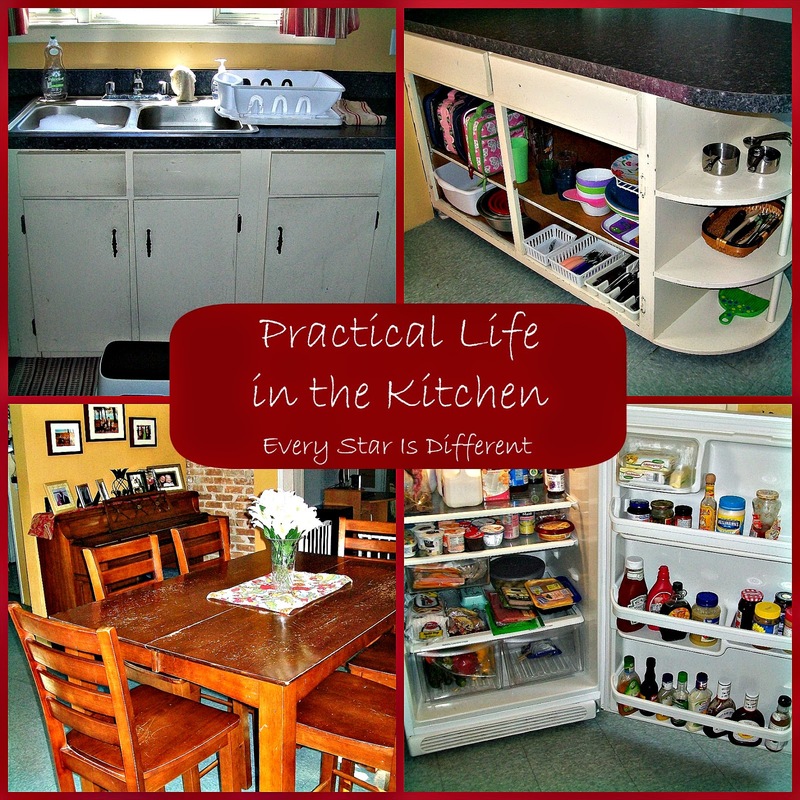 We make it a point to educate everyone in the house about the "why" behind the behaviors. When the boys understand the "why" they're usually able to work through the situation more effectively and they learn to hate Reactive Attachment Disorder, yet love their sisters. The boys are inseparable. They share a bedroom. When we go places, they won't go without the other. At home, the boys won't play with toys unless they play together. They are best friends and always watching out for each other. Their close relationship has proven quite beneficial as it provides a system where neither of them are left alone at any time. 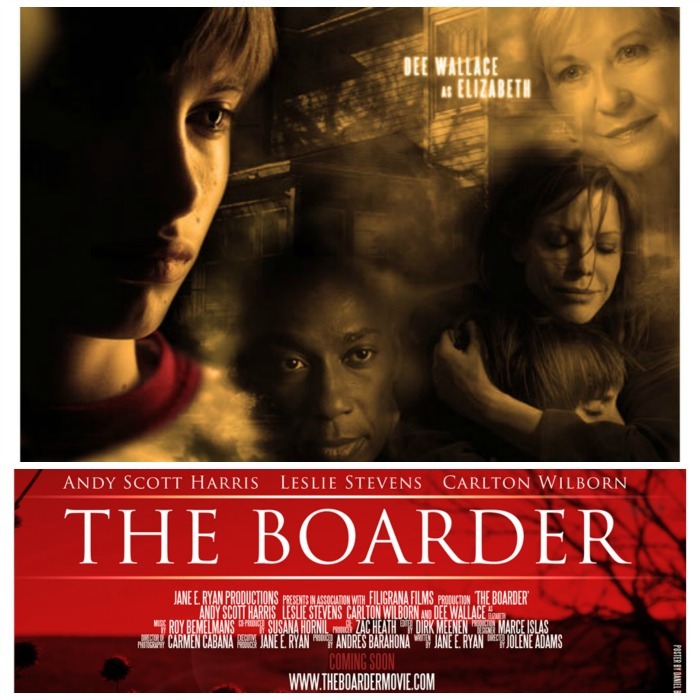 The buddy system works as neither of the girls can target both boys at once. Because of their close relationship the boys are always watching out for one another, ready and willing to protect each other if needed. We spend a lot of time as a family. My husband and I plan each day so that time spent together with everyone will be successful. We bring everyone together to participate in whatever we have planned, only when the activity or event is something that has a good chance of being successful for everyone. If one of the girls tries to sabotage things, she leaves and everyone else continues to enjoy the fun. Participating in family events, routines and traditions provides opportunities for the kids to build happy memories together. So far this has worked. The boys truly do love their sisters. They may not like them or their behaviors at times, but they have a brotherly love for them. I know they would protect them or stick up for them if needed. Dinomite and Bulldozer have a sincere desire to improve relations with their sisters if at all possible. But they also know the girls just aren't capable of doing that yet, and that's okay. They're being the brothers their sisters need them to be. 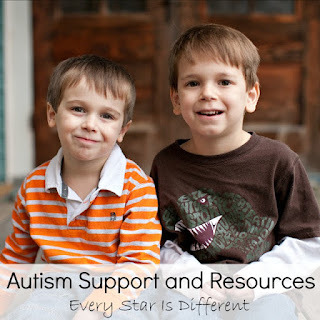 This post is part of the Parenting Children with Special Needs Series! 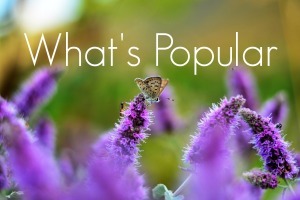 If you enjoyed this post you may want to read more of the articles below. 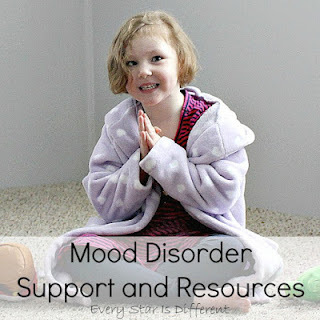 Four weeks ago Sunshine began the process of slowly weaning off of one of her mood disorder medications as recommended by her developmental pediatrician. We had hoped the weaning process would go well, but the opposite occurred. Our family found ourselves in the middle of a mental health emergency where we had to initiate our safety plan protocol. This is only the second time that we have had a mental health emergency in our home. It's the second time we've had to put our planning to the test and hope that everyone stays safe. Words can not express how thankful I am for the time we spent putting together a safety plan. We knew there was a good chance a mental health emergency may occur. 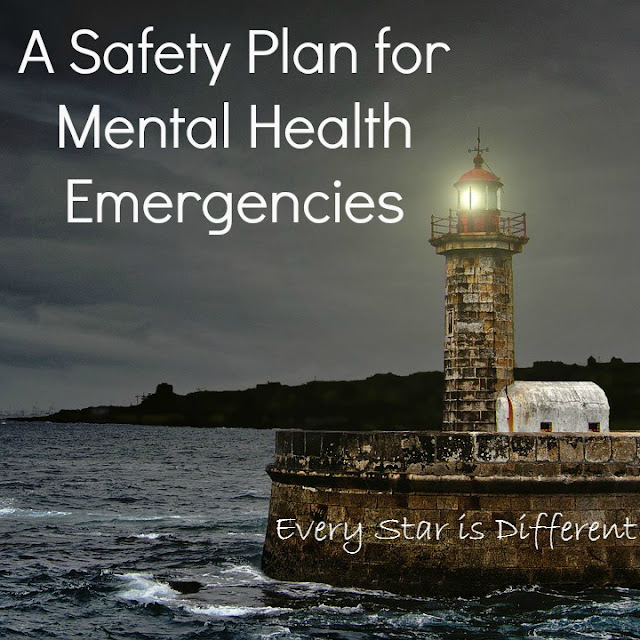 Knowing our family is not the only one that finds itself in this scenario my husband and I have decided to share our experience and a safety plan for a mental health emergencies. 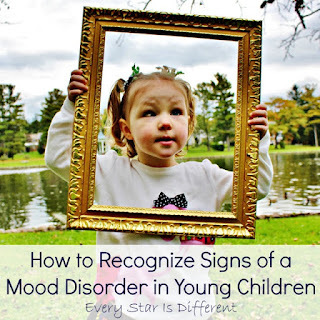 Please know this post is filled with raw emotional content and may be disturbing to some, especially those who may not have experience with mood disorders in children. The plan was for Sunshine to wean off of her medication, reducing the amount by .25 ml each week until finished. At first we thought things were going okay. We noticed extra irritability and some defiance but attributed that to withdrawal and typical control battles common with Sunshine. As planned, we called our developmental pediatrician's office and reported how the first week had gone. The second week didn't go as well. We noticed rages and extreme defiance. Sunshine was becoming physically aggressive. However it was a crazy week. My father had surgery and my mother stayed with us. Daily routines and schedules were changed up, which Sunshine struggles with mightily. 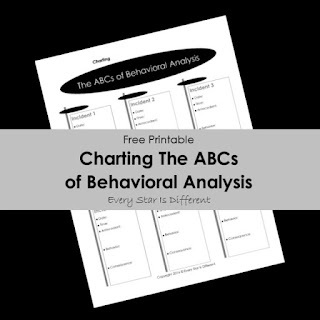 We couldn't be sure behaviors were a result of weaning medication or changes in routine. It was decided to wait another week before reducing the dose again. It only took three days after reducing the dose another .25 ml to know with certainty that things were not okay. The rages and physical aggression ramped up to crazy levels. Sunshine stopped sleeping all together. She was insanely loud. And there was this drive to go. If you tried to interfere or stop her, BEWARE! It was a Monday when everything came to a head. Sunshine couldn't be reasoned with. She was not functioning. What would normally be a calm exchange of words turned violent. Sunshine started to throw any items she could get her hands on. She even threw a dining room chair, almost breaking a window. And then she verbally threatened to kill me with a knife. That's when I knew, my dear sweet Sunshine was horribly manic. She had become a danger to herself and to others. The medicine had been working more than we knew. We were in trouble. I had to initiate our safety plan. Your first instinct may be to go to the child who's having the mental health emergency and help her, but your first priority is to make sure that you and any others who are present are safe. Remember how important it is to put an oxygen mask on yourself in an airplane emergency, before helping the person beside you? The same rule applies here. In our home, all sharp objects are locked up. I knew that even though Sunshine wanted to kill me with a knife, she did not have access to sharp objects, so I was safe. If you don't have sharp objects locked up in your home and you have a child with mental health issues, decide to lock them up before something happens, not after. I am a minimalist by nature and so there are very limited objects that Sunshine can throw at any given time. 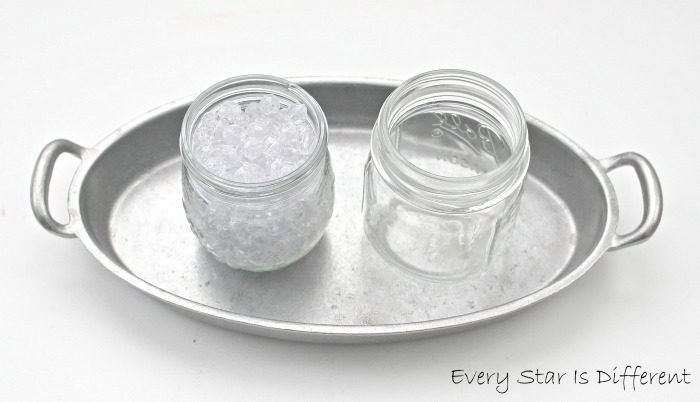 Everyone in the house knows we can't leave things laying around for this very reason. If Sunshine breaks a window, she knows the safety protocol for that. My biggest worry was that she'd try to attack one of her siblings. Though she's the youngest, she is big for her age and very strong. Combine the strength and extra energy that comes with a manic episode... The safety of others is always our biggest concern. My husband Jason is home full time for this very reason. It's part of our safety plan. One of us takes the lead with Sunshine. 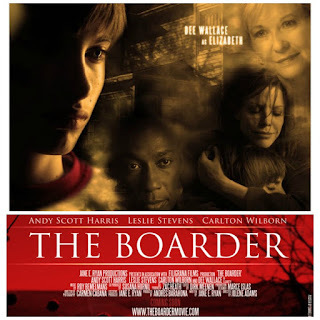 The other attends to the rest of children, removing them when necessary to ensure everyone stays safe. On this day, my husband was already gathering the other kiddos outside to play. I was taking the lead with Sunshine. If you are dealing with a child who is having a mental health crisis you want to follow prepared steps to deescalate the situation if possible. When these steps don't work, safety comes first. Steps used to deescalate the situation should be prepared ahead of time and approved by doctors and specialists. Most often these professionals will help in the planning process. We have learned that the only way to stop Sunshine when on the rampage is to grab her and hold her until she is finished raging, and becomes calm and rational. Depending on the situation and how manic she is, this can take anywhere from 20 minutes to over an hour. My husband and I have tried every other method imaginable, so as to not have to restrain her in any way, but none have worked. 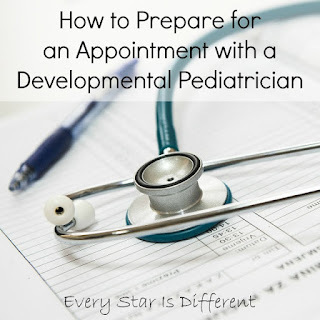 We have spoken with our developmental pediatrician about everything. She has seen Sunshine at her worst and witnessed the violence. During appointments when Sunshine is out of control, the developmental pediatrician has sat with me as I've held Sunshine, witnessing the fight and screaming. It's documented in Sunshine's charts that when she becomes unsafe, we are to grab her and hold her until she is okay. Sunshine knows this also. She knows we will let go when she can be still, kind, and quiet for five minutes. I can not express to you how much physical, mental, and emotional energy it takes to hold a child who is kicking, screaming, and fighting to get away. All a parent wants to do is help their child feel better and make everything okay. 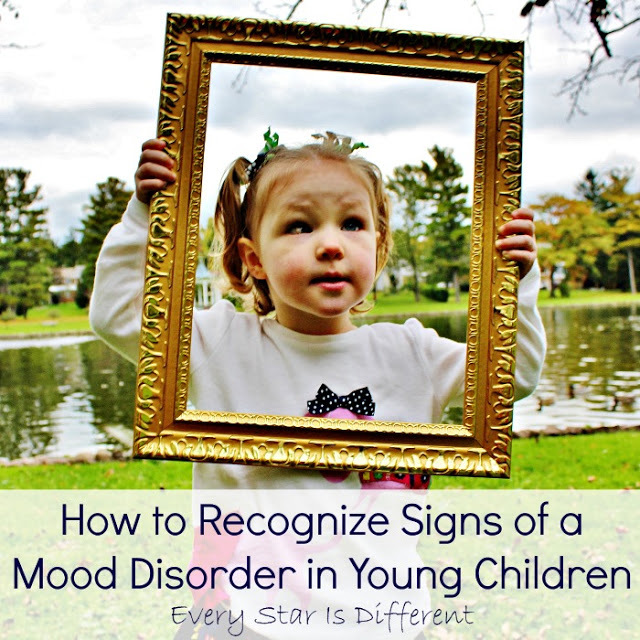 But when a child is manic, this is rarely ever possible. I cry every single time I have to hold Sunshine in this way. Every. Single. Time. If you can not calm your child, your child is too big to hold safely, or is being violent towards another person you may need to call law enforcement or other support for help with this process. In some cases your doctors may recommend calling law enforcement instead of holding your child. Follow the advice of your medical professionals. Once the child is calm and safe, immediately call your doctor or other specialist to report the incident. You may also want to document it in a notebook for your own purposes. This process helps your child. Doctors and specialists are made aware of behaviors as they happen, which helps them create a better treatment plan for the child and builds trust in their relationships with you as the parent. Reporting incidents and keeping your own documentation also protects you as a parent. Everyone involved knows you're doing everything in your power to help your child and keep all family members safe. If a concerned neighbor or other person unfamiliar with the situation calls law enforcement, you will have everything you need to work through any process that may result from that. After Sunshine was calm, I immediately called her developmental pediatrician's office, explaining the scenario. A nurse called back within the hour asking for more details. She conferred with the doctor and an appointment was scheduled for two days later. The nurse asked if we had a safety plan to help get everyone through until we could meet with the doctor. I shared details and it was documented. During a medical emergency, there's a chance that concerns can be addressed immediately and the problem is resolved. Other times treatment and recovery take time. In situations regarding mental health, there is no quick fix. Whether it's waiting for a doctor's appointment, medication, or another course of treatment, you will probably find yourself waiting with a child who is unsafe. 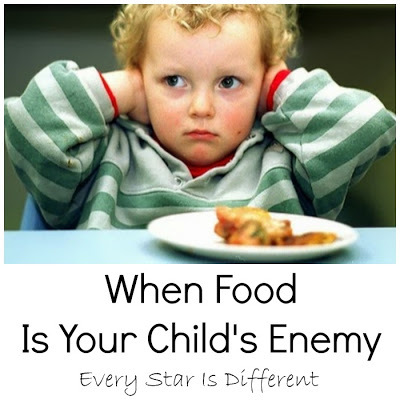 It's during these times that you must lower expectations of your child, other family members and yourself. Your primary concern is keeping everyone safe. If rage, physical aggression, or violence can be avoided, you do it, even if that means your child is watching their favorite tv show or playing their favorite video game the entire day. You want to keep your child calm. All other obligations and responsibilities are delegated out when possible or cancelled all together. If you're able to provide safety, support and consistency for other family members do it. When that's not possible, ask for help. You can not do this on your own. My husband and I knew we could keep everyone in our family safe because of plans already implemented in our home and because both of us are home full time. We knew we could do nothing else outside of our child care responsibilities, so we asked for help in any way people could provide it. Meals were brought in. People ran errands for us. Whatever we needed, people responded to the call. Once you have reported the incident, it is extremely important to follow through with any recommendations made by doctors and specialists immediately. 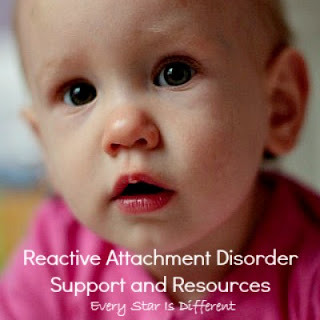 The sooner your child is stabilized the better. Following through with recommendations is also a great way to protect yourself as the parent and build trust with professionals. You will need these professionals to advocate for your child and for you. They need to see you're doing your part. 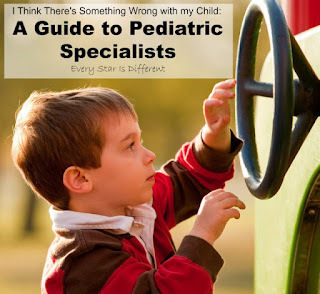 Sunshine's developmental pediatrician's office is about 90 minutes from our home. This isn't too bad, except in the winter, when there is snow. My husband and I watched the weather which appeared to be in our favor up until the day of our appointment. There was a Lake Effect Snow Advisory that would begin two hours before our appointment and last all the way through until the next night. Knowing we couldn't miss the appointment, we packed everyone up as soon as possible and booked a suite in a hotel for two nights less than five minutes from the hospital. Sunshine had another appointment at the same hospital the very next day. This had been scheduled months in advance. All six of us stayed together to avoid any unnecessary triggers for Sunshine due to separation. My husband took Sunshine to her appointments while I remained at the hotel with the other kiddos. The developmental pediatrician couldn't believe how manic Sunshine was and told us to immediately increase the dose of her medication back up to where it was before problems began. Effects of the increase wouldn't be seen for about a week, but at least it was something. She then prescribed another mood disorder medication in hopes that with all medications at work we could stabilize Sunshine. The new medication needs to gradually increase and build up as to avoid severe side effects. This means that we won't reach a therapeutic dose for some time, but we're continually working on it. It's been a week since Sunshine turned violent and five days since our appointment with the developmental pediatrician. We've started to see improvements today, but she's still manic. Expectations continue to be low to avoid further issues. Extra supports are still in place and needed. We are hoping by the weekend she is doing better. Though exhausted, my husband and I are filled with gratitude and counting our blessings. Safety plans had been set up ahead of time and they worked. No one was hurt. Everyone is safe. Sunshine is still with us, and for that we are thankful. We love our daughter and are willing to do whatever we can to keep her happy, healthy, and safe. Sunshine did not ask to have a mood disorder. She can not control when she has manic episodes. As her parent, I can help her. I can advocate for her. I can fight for her. She needs that and deserves nothing less. This is not her fault. And so I fight. My husband fights. We will do all we can to help her live the best life possible. Antarctica is my favorite continent to study. I love everything about it. Visiting the continent is definitely on my bucket list of things to do in life. My kiddos share my enthusiasm. Dinomite, Bulldozer, and Princess completed an Antarctica unit study a couple of years ago. This year, it's Sunshine's turn. 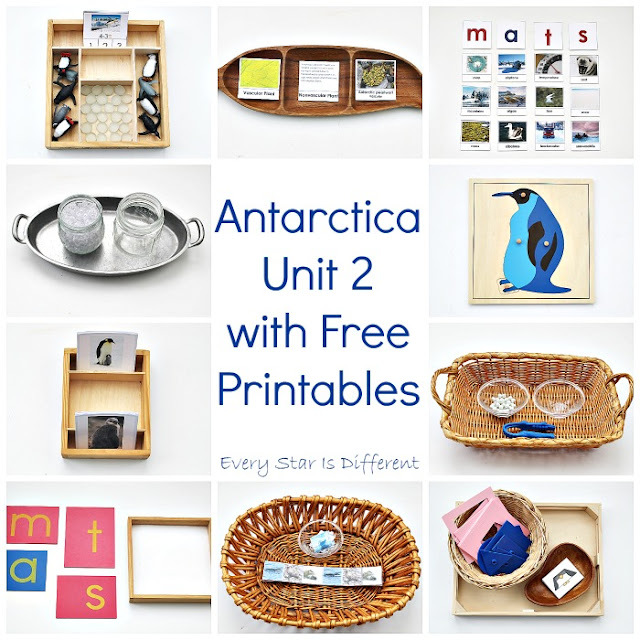 I am so excited about the activities in our Antarctica Unit 2 with free printables. Sunshine has practiced writing her letters using her salt tray this week. The salt represents snow. Our Sunshine enjoys using her finger to draw letters, but also uses a penguin at times. 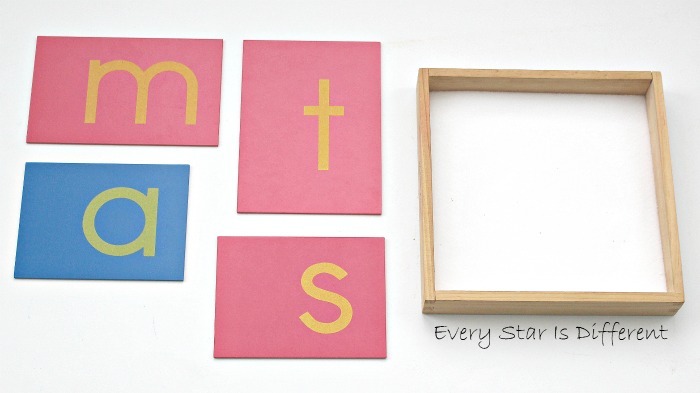 Montessori Sandpaper Letters are provided as a control, as Sunshine can trace the letters when needed. Sunshine is working hard to learn the sounds that correspond with the letters she's trying to write. This activity encourages that, as she sorts picture cards by their first letter and sound. I have labeled each picture card as a control for Sunshine. Once she's more comfortable with the sounds and how the activity works, I'll cut off the labels and only use pictures. 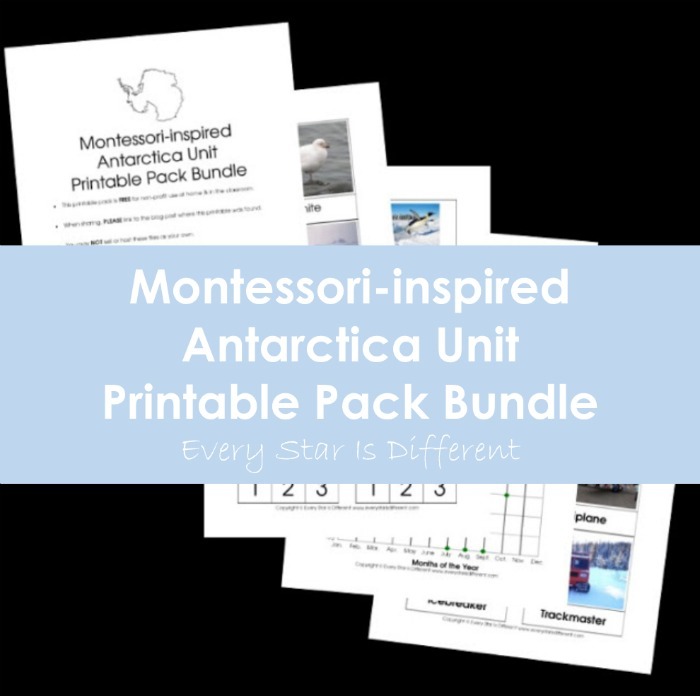 Source: I created the printable for this activity as part of my Antarctica Unit Printable Pack 2. For your free copy, click on the subscriber's link at the bottom of this post. This is a subscriber's only freebie. If you have already subscribed, you will find a link to the printable in your most recent newsletter. Sunshine is starting to understand how to subtract numbers. 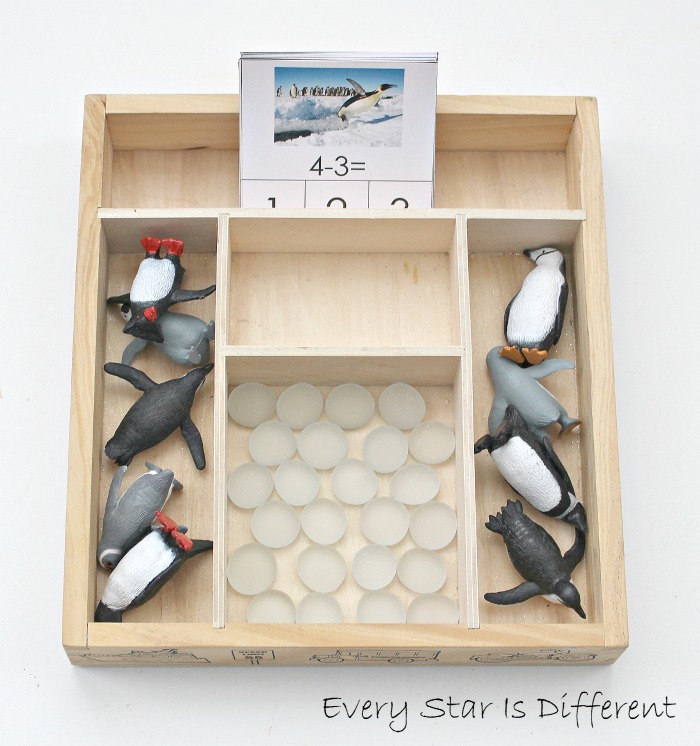 In this activity she is subtracting penguins as they jump out of the water. 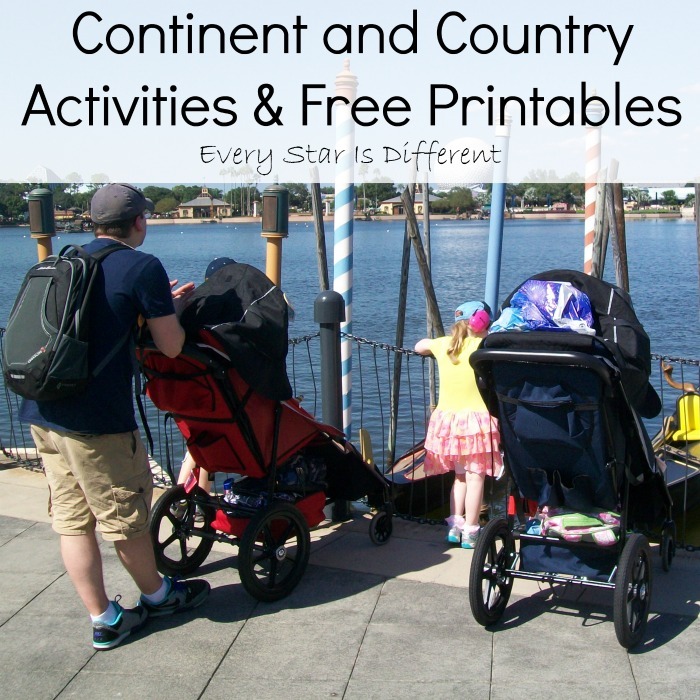 I just love the picture on this printable. It makes me smile every time. 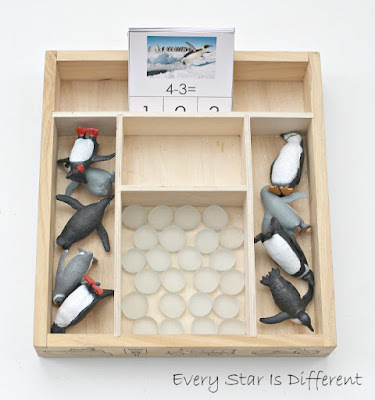 Sunshine is using penguin figures as counters and frosted glass beads as markers. Sunshine thoroughly enjoys pattern activities. She especially likes this one as it includes images of animals from Antarctica. Each individual cut out image is matched up to a pattern strip provided. Sunshine loves our Montessori puzzles. I purchased this penguin puzzle specifically for her. She enjoys taking it apart and putting it back together. 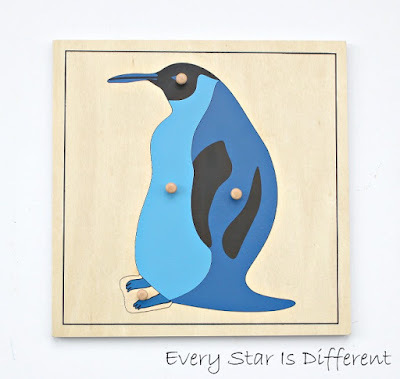 When she is able, she can also practice tracing each piece of the puzzle on to paper to create her own penguin. Sunshine's favorite subject is botany. If there is a botany activity on the shelves, she's a happy girl. 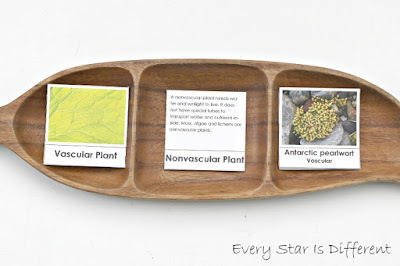 In this activity Sunshine will be introduced to vascular and nonvascular plants that live in Antarctica. 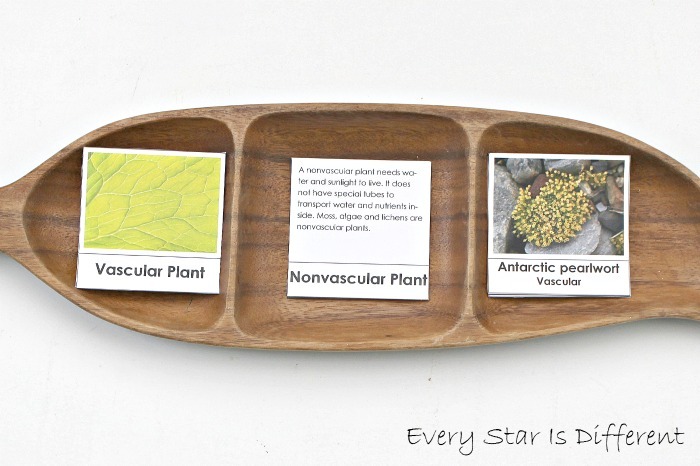 There aren't many of them, but the purpose of the activity is to teach that there is plant life on the continent and to learn the definitions of new plant vocabulary terms. The last time Sunshine studied penguins she was confused by the differences between adult and baby penguins. They all look so different. 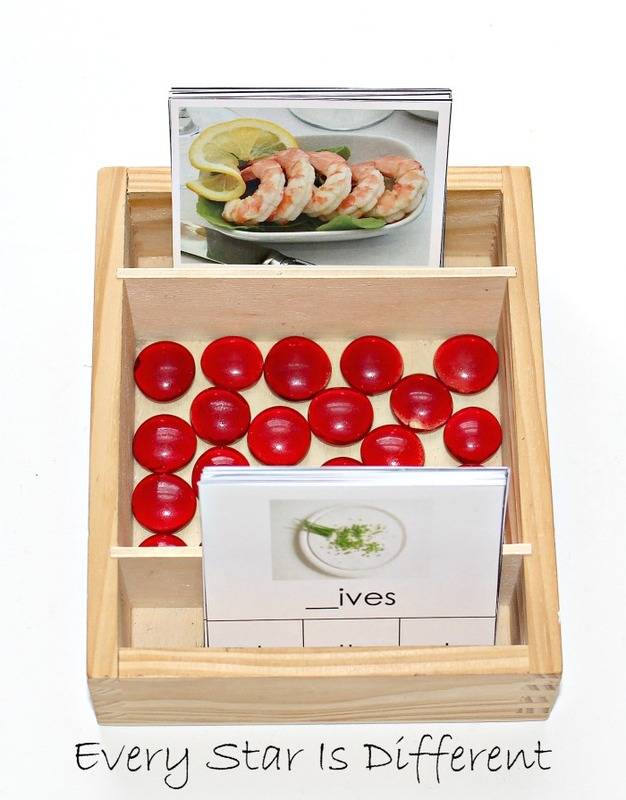 This activity is being used to help her understand these concepts. 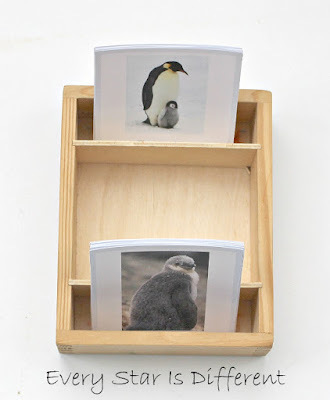 Sunshine uses a picture of an adult and baby penguin and then finds the adult and baby that matches each pair card. Source: This free printable for this activity can be found at Trillium Montessori. Over the past few weeks, Sunshine has shown an intense interest in learning about shapes. 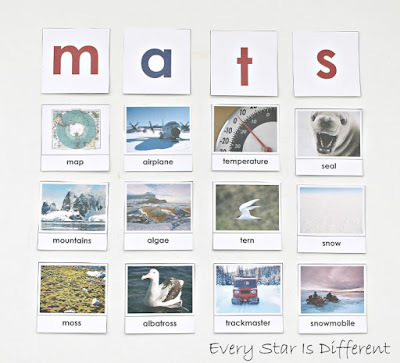 This activity was created to encourage further learning and exploration. 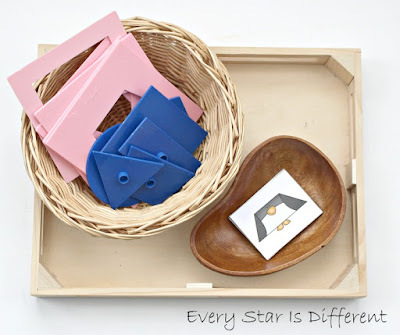 Montessori Metal Insets are used in this activity to provide hands-on manipulation and dimension. 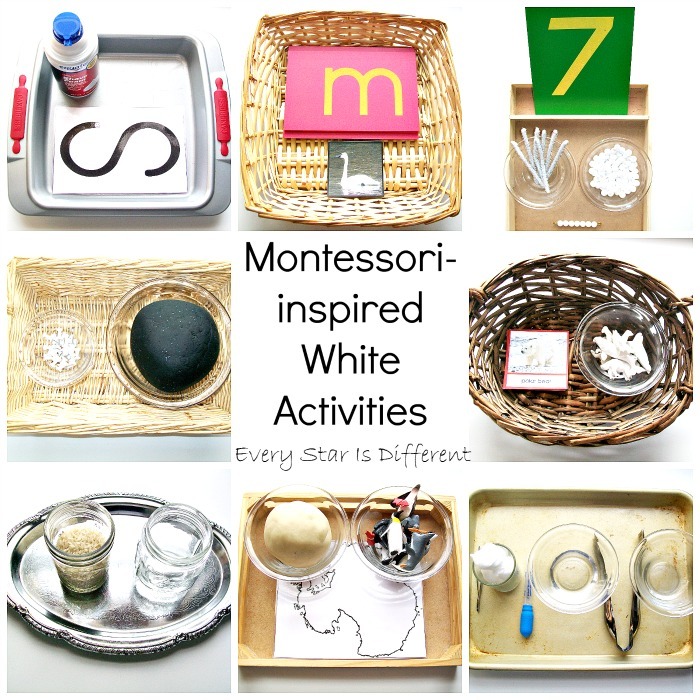 Source: The idea and set up for this activity can be found at Living Montessori Now. 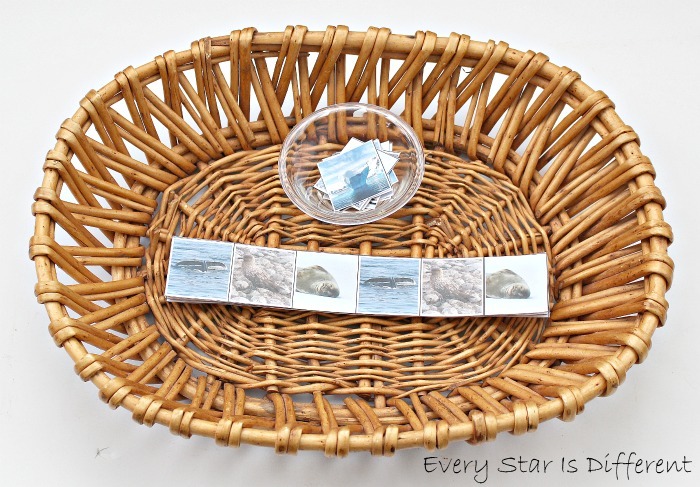 The free printable for this activity can be found at Life Over C's. It's been a while since Sunshine has done a pouring activity, especially one that includes a solid. Sunshine is doing quite well at pouring the "ice crystals" aka acrylic beads from one glass jar to the other. 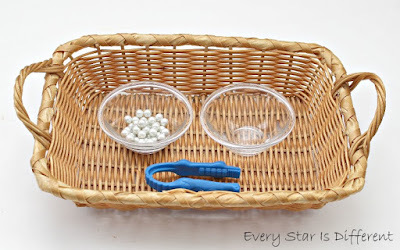 In this activity Sunshine transfers "snowballs" aka white pearl beads from one glass bowl to the other using the tweezers provided. The key to success with this activity is to make sure the beads are large enough for her to grab easily. 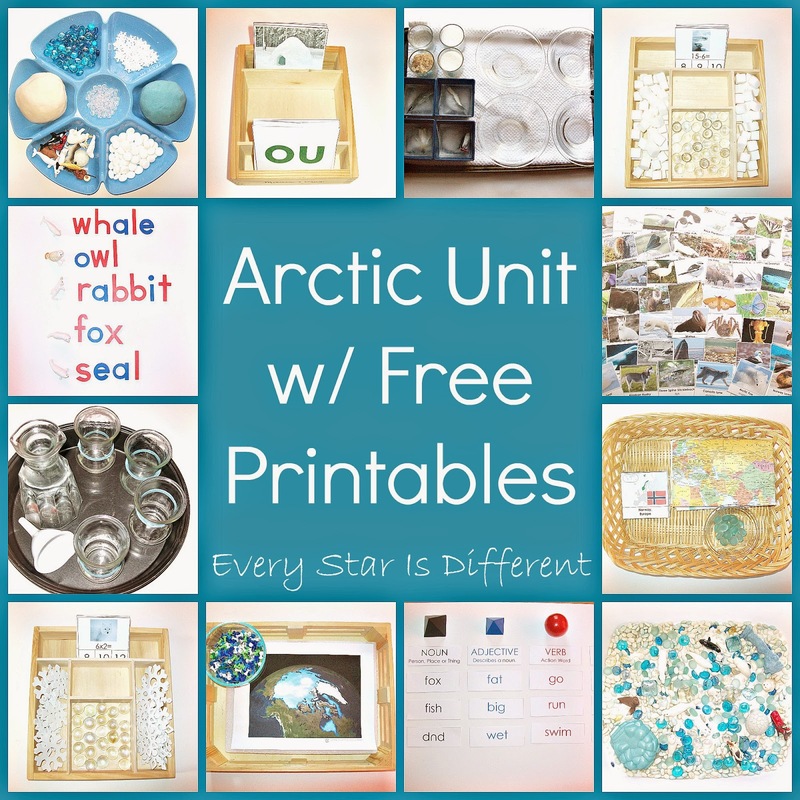 For those interested in receiving the free printables used in the activities above, click on the link to subscribe to our free weekly newsletter below. Sunshine is having so much fun with her Antarctica activities. We hope that your child loves them just as much! Managing strong emotions can be extremely difficult for adults. Just imagine how difficult it is for a child. And then when you have a child with special needs... The task seems like an impossible feat. The behaviors that result can be terrifying and debilitating for both parents and child. If a child with special needs is to be successful in life he must learn how to manage strong emotions on a daily basis. 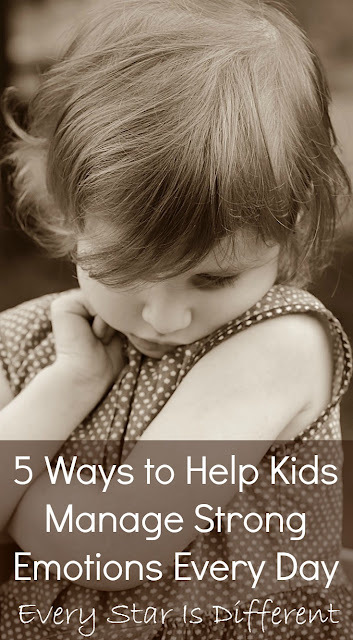 My husband and I are constantly working with our children to help them do just that. 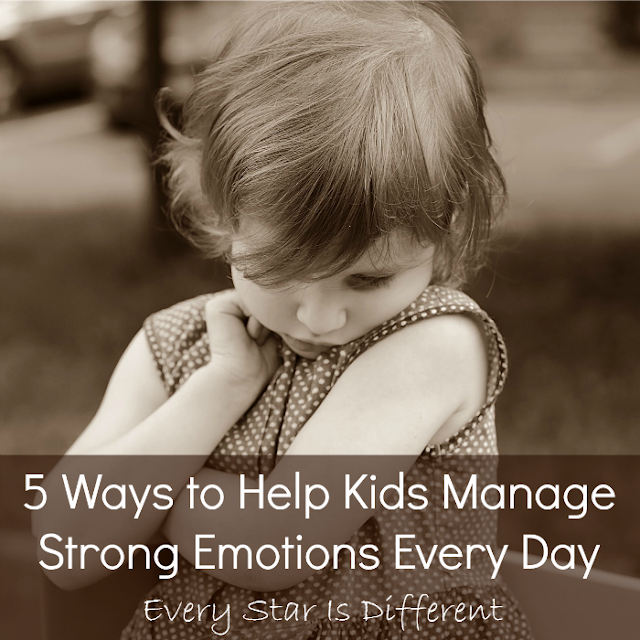 In the process we have developed 5 ways to help kids manage strong emotions every day. 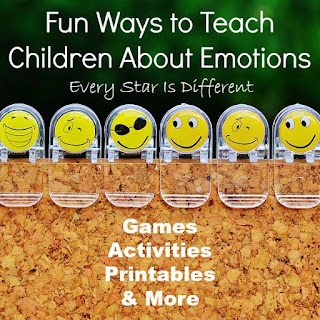 When our four children with special needs choose to use these tips, they are successful at managing their emotions on a daily basis. As a result everyone is healthy and functioning at their best. There are many times during the day when a child may become mad, sad, lonely, scared or happy. In these moments it's important for the child to be able to express his emotions verbally using the phrase, "I feel ____ when ____." There may not be anything that can be done at the time to make things better, but the expression of the feelings can make a world of difference, especially when an adult acknowledges them. 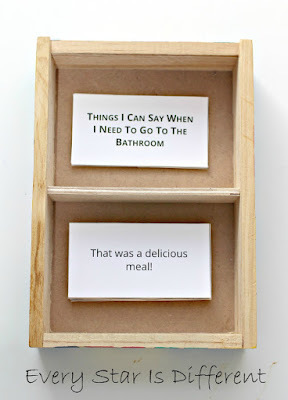 Sometimes in our home, I may need to remind the child to talk about feelings, but usually it only takes a single prompt if anything at all. All of these things can help him function better. 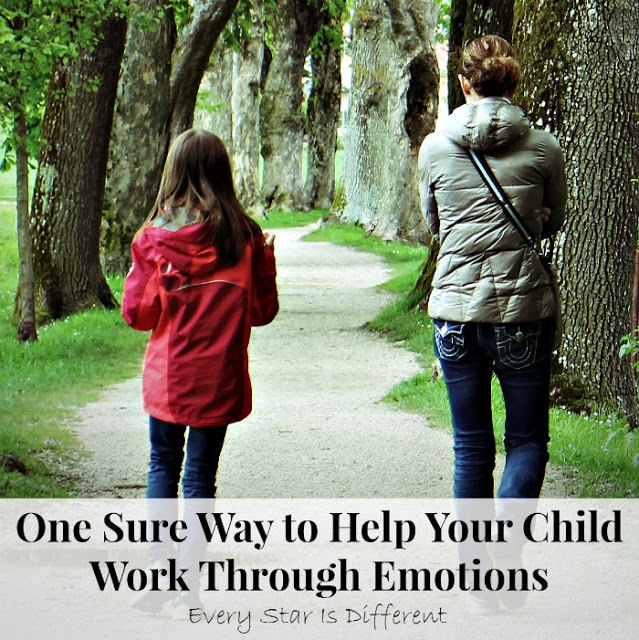 Once the child has finished exercising the emotions will not be as strong, making them easier to talk about. At times we forget how important drinking water can be for our bodies. The benefits are endless. When it comes to managing strong emotions, drinking water is extremely important. Just the act of drinking water can calm a person down. Our bodies work so much better when we're well hydrated. If a child is drinking 8 cups of water a day, his ability to function and manage strong emotions will improve. Each of our children have water bottles that they use throughout the day at home to better keep track of their water intake. 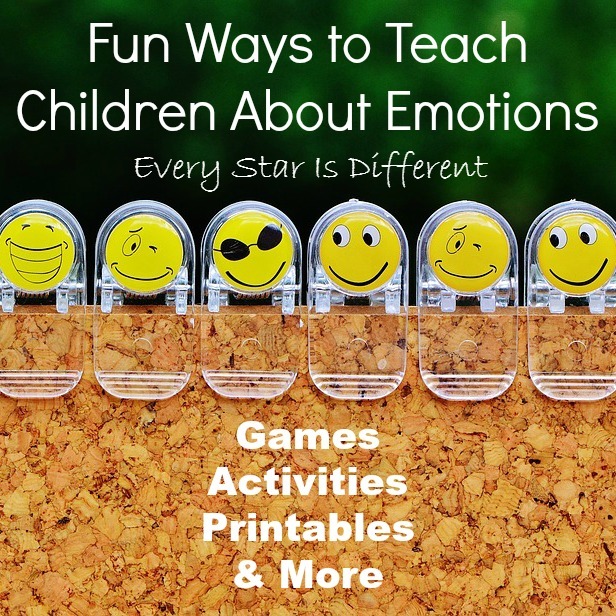 When a child expresses his feelings and works through them on a daily basis there is much less of a chance that emotions become too strong to manage. Set aside a specific time of day to discuss feelings and work through them with your child. Eventually this will become a routine that the child can look forward to, especially if he's expressed emotions earlier in the day that you haven't been able to address. 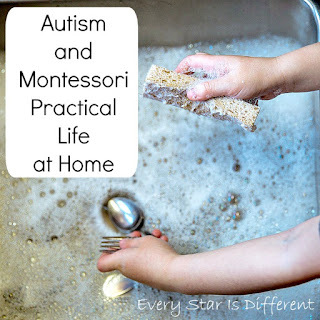 The best time of day for us to help our children work through emotions is during dinner prep. We will check in with each of them. If any of them need to work through anything, it's the perfect time to do so. It's always best to end the day on a positive note. 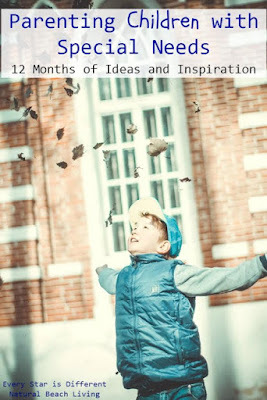 Encourage your child to express happy moments from the day right before bed. Ending the day discussing the highlights can be very soothing and lead to sweet dreams. If the child sleeps well, emotions will be easier to handle the next day. This is my favorite part of the day. 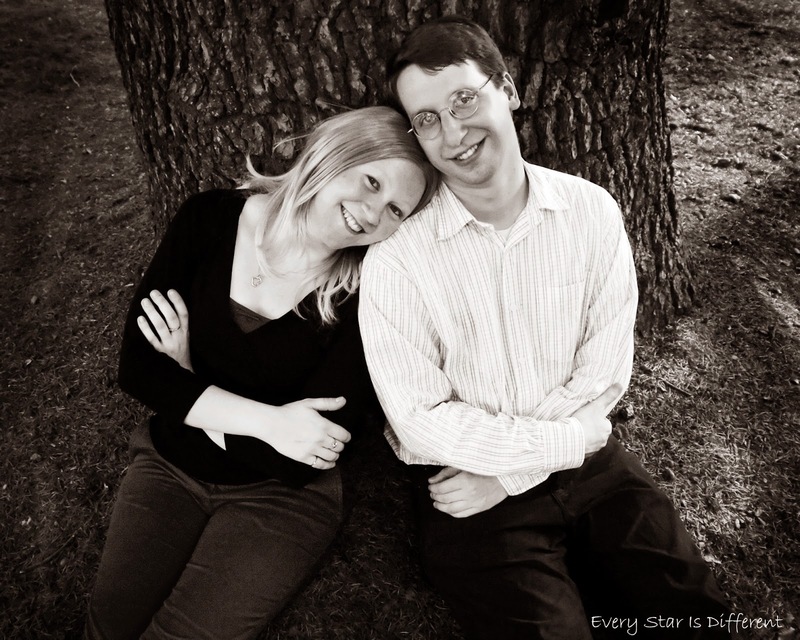 I love hearing about happy moments, especially when it's been particularly difficult for me. The five ways to help kids manage strong emotions every day have made such a difference in our home with all of our kiddos, especially those with emotional disabilities. It takes a lot of hard work and consistent effort to push through each day but the rewards are so great for everyone. I challenge you to try it out and see how it goes. We have had so much fun learning about the digestive system and nutrition this week. My body units are always such a success with the kiddos. 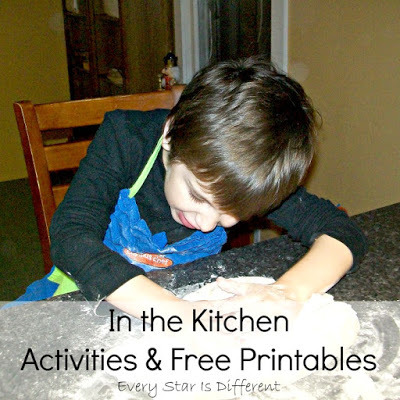 When activities are combined with free printables, everyone wins! In this unit you will find activities and printables for every main subject area and then some. My husband and I worked extremely hard to create a well-balanced unit study that will work for typical children and also those with special needs, including special dietary needs. 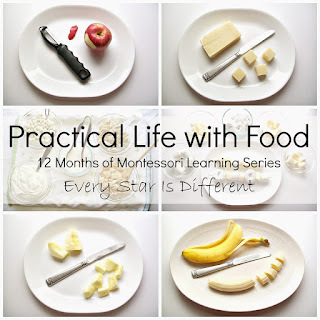 A nutrition unit is the perfect opportunity to study food. These cards include names of foods that include the blends: ch, sh, th, and qu. 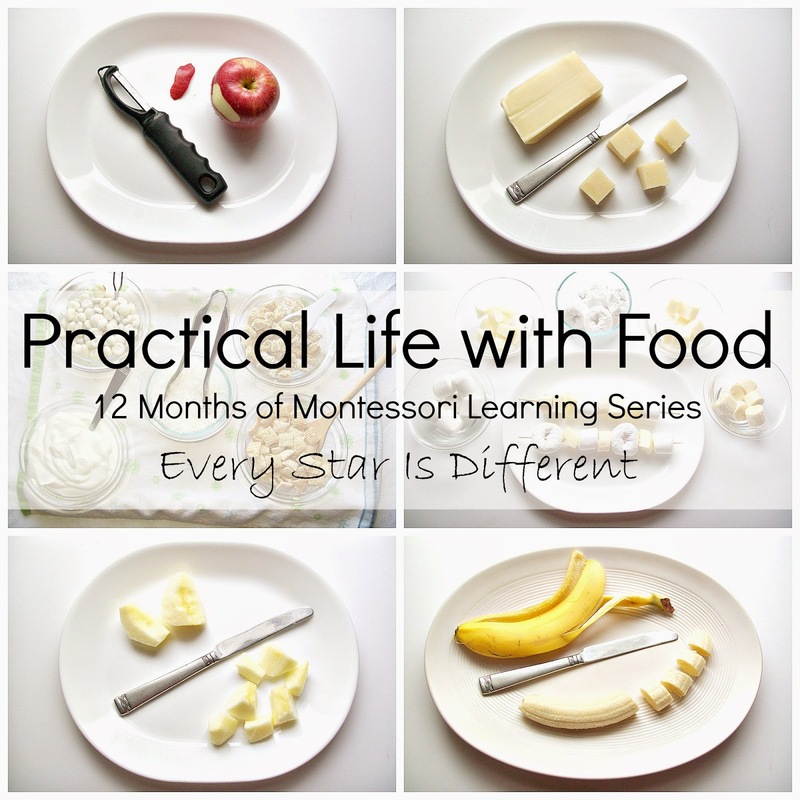 I specifically chose some foods that were a little different to develop vocabulary at the same time. 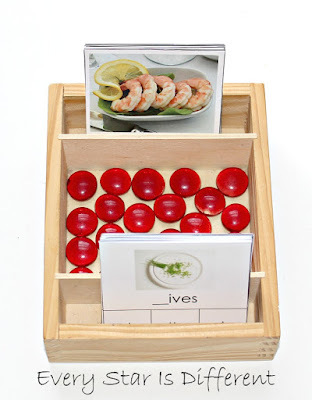 Source: I created the printable for this activity as part of my Nutrition Printable Pack 1. For your free copy, click on the subscriber's link at the bottom of the post. This printable is a subscribers only freebie. 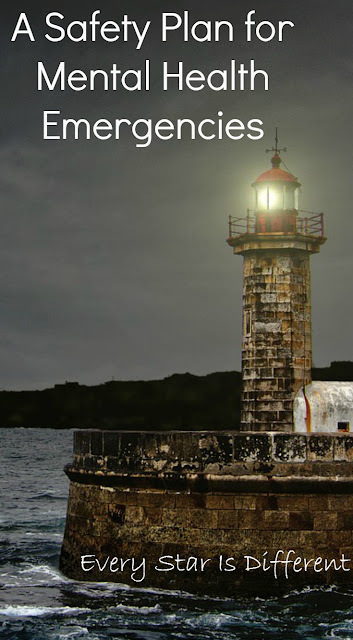 If you are already a subscriber, you will find a link to it in my most recent newsletter. Many foods have names that are compound words. 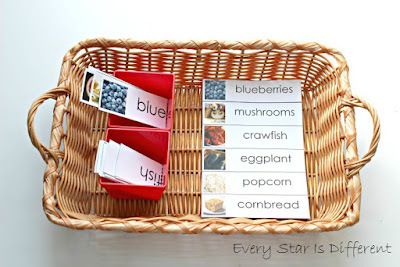 In this activity the kiddos will match up word strips to create the compound words on the control cards. Source: I created this printable as part of my Nutrition Printable Pack 1. For your free copy, click on the subscriber's link at the bottom of this post. This printable is a subscribers only freebie. If you are already a subscriber, you will find the link in my most recent newsletter. The kiddos sort the phrase cards and put them under the proper title card. Everyone has enjoyed this activity and are applying the phrases to everyday situations which is great. 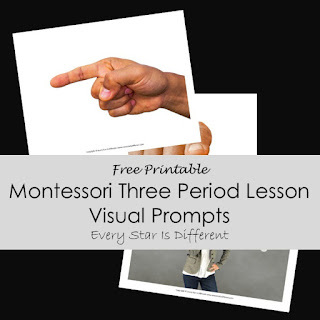 Source: The printable for this activity can be purchased from And Next Comes L, as part of a Social Scripts Mini Flip Book Bundle. This bundle consists of 16 title cards with multiple phrase cards for each scenario. These are a perfect addition to a Montessori Grace and Courtesy Lesson, or used as an aid to those with autism or other special needs. 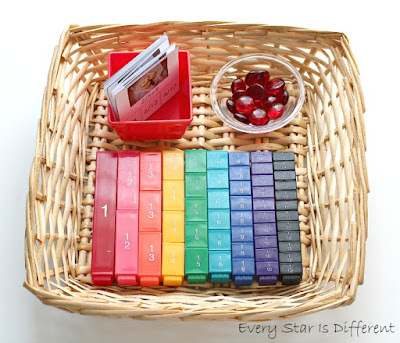 The kiddos do so well at addition now, whether it's simple or there is carry over. However, until this week, they haven't worked with dollar signs and decimals. Thankfully the symbols didn't scare them off. They did a fabulous job and are now confident adding money. Source: I created the printable for this activity as part of my Nutrition Printable Pack 1. For your free copy, click on the subscriber's link at the bottom of this post. This printable is a subscribers only freebie. If you are a subscriber already, you will find the link in my most recent newsletter. This is the favorite activity on the shelves this week. Who knew fractions could be so fun? In this activity the kiddos are trying to find equal fractions using the fraction tower cubes provided. They really have had such a blast with this! Source: I created the printable for this activity as part of my Nutrition Printable Pack 1. For your free copy, click on the subscriber's link at the bottom of the post. This is a subscribers only freebie. If you're a subscriber already, you will find the link in my most recent newsletter. Does one cup of dried beans weigh the same amount as a bag of kidney beans, lentils, or split peas? 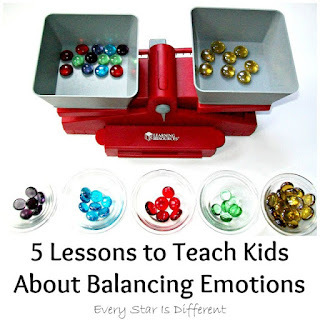 This is what the kiddos are finding out using our balance scale. I love this activity because it is a math and Practical Life activity combined. In this activity the kiddos sort food items by food group. 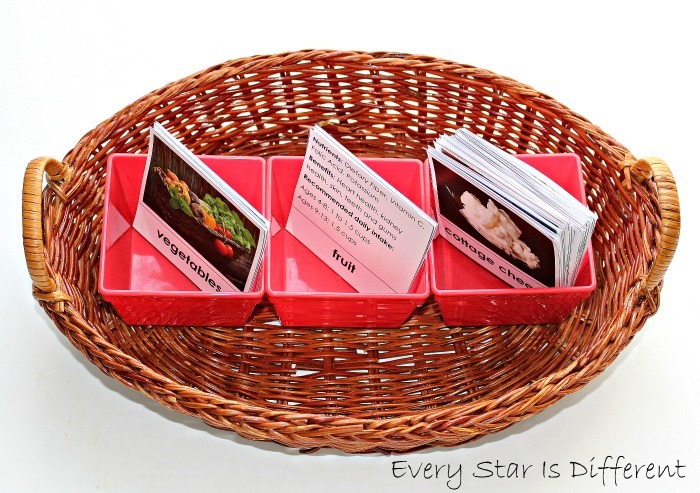 There are also informational cards for each food group. All of kiddos had a very enjoyable time with this activity and sincerely showed such a desire to learn. I loved watching them talk about each food card. 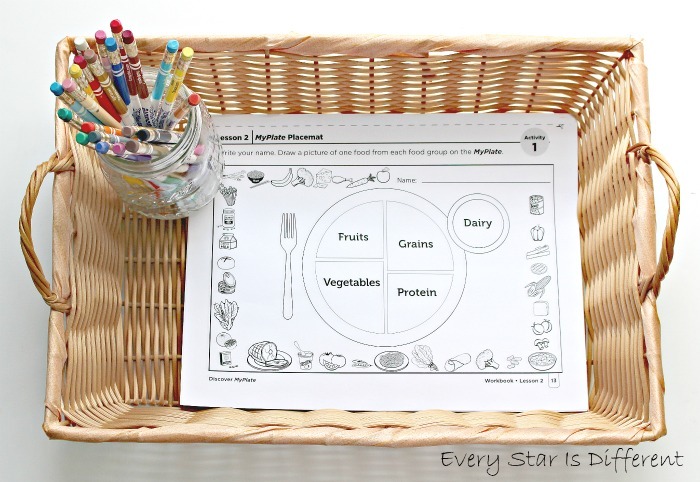 Source: I created the printable for this activity as part of my Nutrition Printable Pack 1. For your free copy, click on the subscriber's link at the bottom of this post. This is a subscribers only freebie. If you are a subscriber already, you will find the link in my most recent newsletter. Nutrition and digestion go hand in hand, hence why we're studying them at the same time. 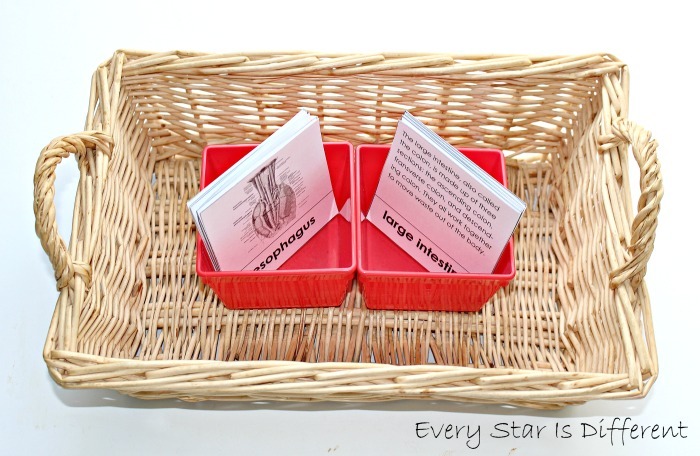 The kiddos have matched up body part cards with description cards. They really have enjoyed learning about what each part of the body does to help with digestion. 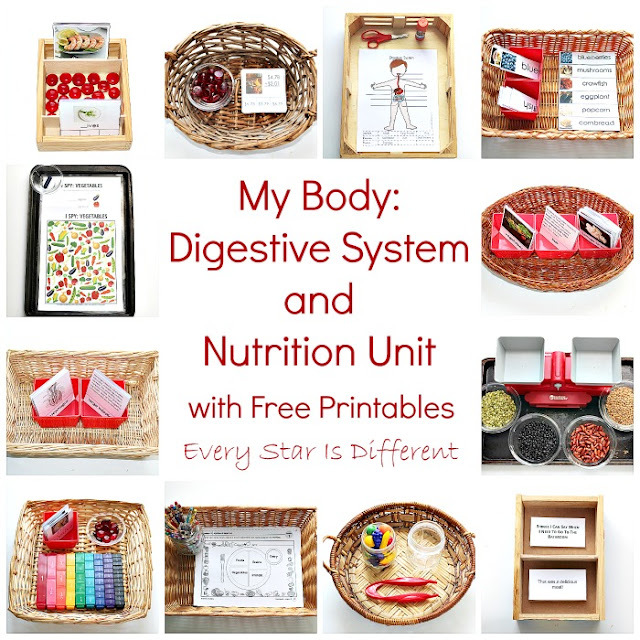 Source: I created this printable as part of my Digestive System Printable Pack 1. For your free copy, click on the subscriber's link at the bottom of this post. This is a subscribers only freebie. If you are a subscriber already, you will find the link in your most recent newsletter. 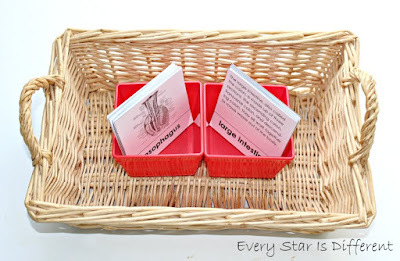 Besides using the cards above, I wanted the kiddos to understand where each part of the digestive system is in the body. 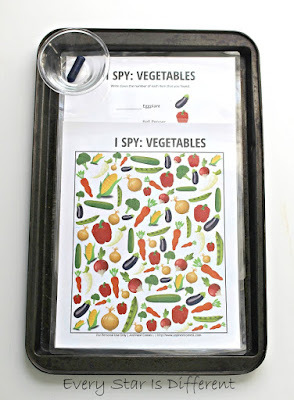 In this activity, the kiddos cut out the strips of paper at the bottom of the page and glue them in the correct spots. I printed out an answer sheet as a control. 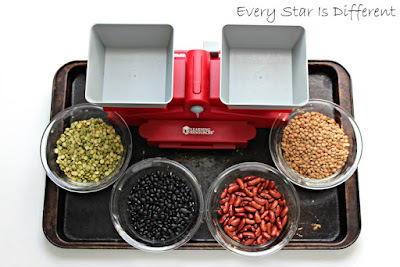 I love that this activity teaches science and practical life skills at the same time. Source: This free printable can be found at Living Life and Learning. As the kiddos learned about each of the food groups, we decided to put our new found knowledge to use. Each kiddo drew pictures of meals they would eat using the template print out. They had so much fun, and felt so confident after knowing that they could eat a healthy meal (if they wanted). Source: The free printable for this activity can be found here. Over the summer my kiddos, particularly Bulldozer and Princess expressed an interest in I Spy activities. This inspired me to do some digging. I found this one which is absolutely perfect for our nutrition unit. 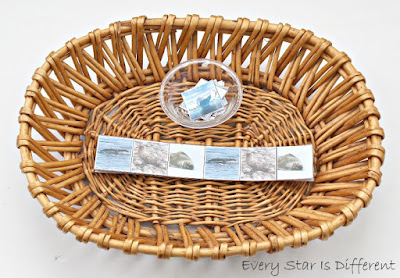 Source: The free printable for this activity can be found at And Next Comes L.
The kiddos had fun with this transfer activity. It was far more difficult than they expected due to the shape of the jars and the size of the tweezers. Still, they practiced every day. Fruits for this activity are from our Super Sorting Pie. 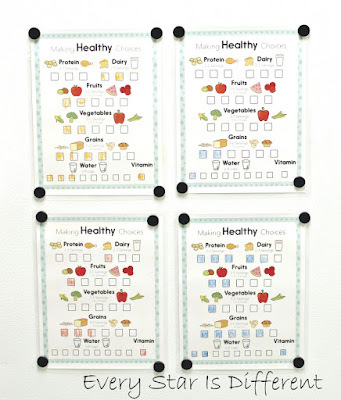 Charts vary as one child has only filled in breakfast items and the others have filled in lunch choices as well. Now I must confess after you've seen all of our fun and fabulous activities that I was petrified about this unit. And after the first day, I was even more worried. I had no idea how the kiddos would respond to the information with all of the food issues related to sensory sensitivities and other special dietary needs. Sure enough they surprised me. 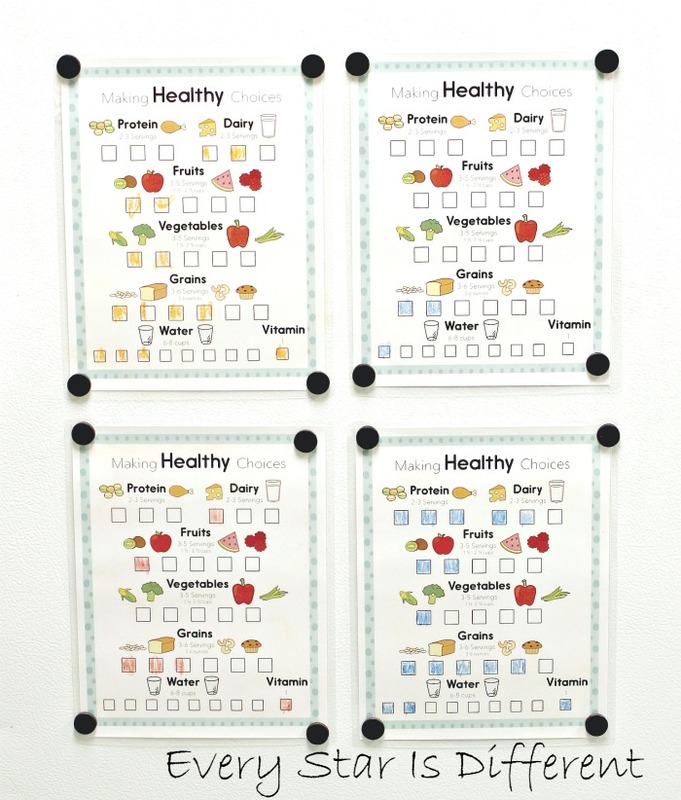 After teaching about all of the food groups and daily requirements, I introduced this Making Healthy Choices daily checklist along with the most recent food pyramid. Everyone "practiced" with their own checklist for a couple days to observe their habits. The results were quite surprising. 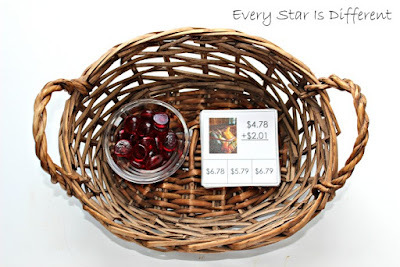 Then, after a couple of days we went to the grocery store and picked up everything we would need to help the kiddos be successful with their charts. It's been a week now and the kiddos are still using them. They're not freaking out if they go over daily limits or if they don't get enough, but they're striving to follow the guidelines as closely as they can. Even Jason and I are using the sheets as they're perfect for helping us with weight loss goals. 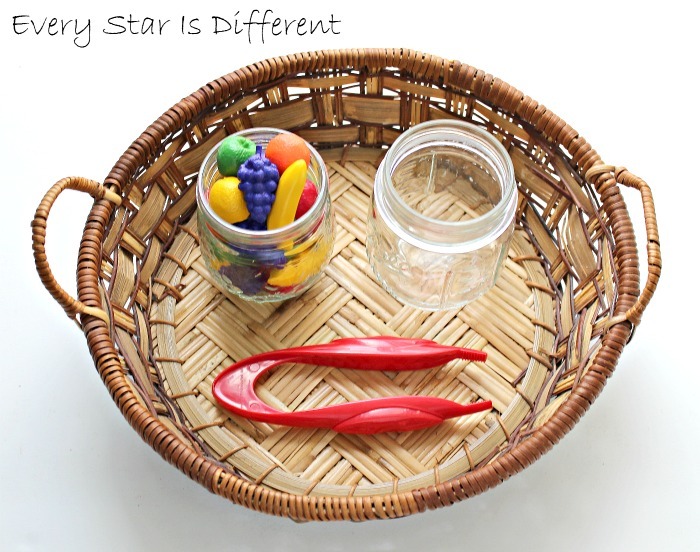 Source: The free printable for this activity can be found at Family Food and Faith. 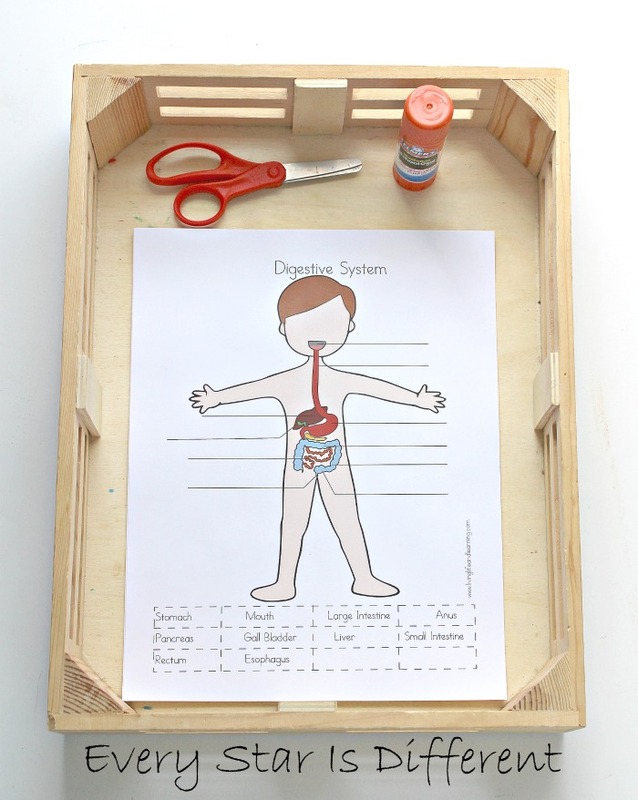 We have had so much fun learning about the digestive system and nutrition. The experience was much more pleasant than I thought it would be. I'm so impressed with how receptive the kiddos have been to it all. Learning about this stuff can be fun! 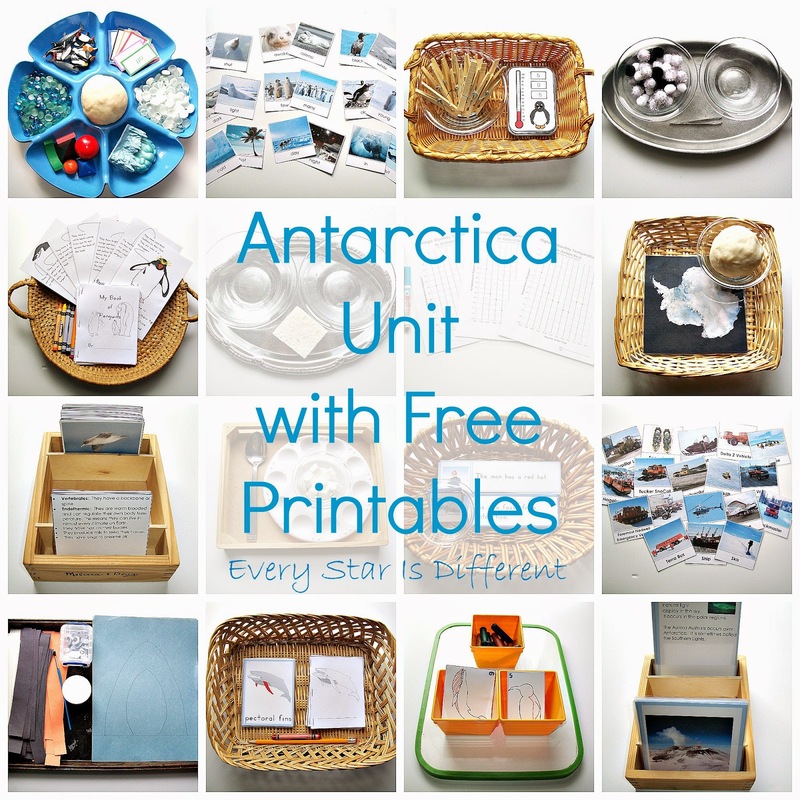 For those interested in the free printables click on the link to subscribe below. If you enjoyed this post, you may also enjoy the following.